Learn the base 625 wordlist, Kanji and all. Now in solidarity with all the folks waiting for the Japanese pronunciation trainer, I’m waiting for it too. As such, I haven’t started on step #1 yet. So…I skipped it. 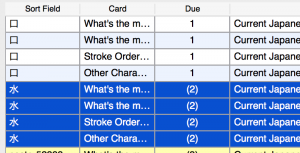 I’ve jumped ahead to step #2 (they’re basically unrelated anyways, so not much harm there), and in this post, I want to share some of the fruits of my labors – a 320 card Anki deck that should give you the ability to actually remember Kanji characters. (Quoted from the Logograms page:) If you’re not familiar with the idea of radicals, here’s a quick introduction. When I look at the word “Apple”, I see a 5 letter word. What I DON’T see is ”A – 2 diagonal tall strokes, 1 horizontal mid stroke; p – 1 vertical low stroke, 1 curved stroke with an opening on the left, p – 1 vertical low stroke, 1 curved stroke with an opening on the left, l – 1 vertical mid stroke, e – 1 horizontal mid stroke, 1 most-of-a-circle-but-open-on-the-right stroke”. I see 5 letters because each of those symbols (A, p, l, and e) are chunked blocks in my mind. So I’m going to learn to do the same thing with Kanji/Hanzi characters. From the top down, it’s 艹, combined with 二 and 厶. If I knew those three characters in advance, then assembling this character (which means, roughly, ‘Art’) in my mind wouldn’t be that hard. It’s about as hard as learning a 3 letter word in any other language. My main job, then, is to make sure I know all of those component characters, so I can look at something as complex as 芸術家 and see a word composed of letters, rather than 28 individual pen strokes. All in all, there are around 200 component radicals I need to care about. 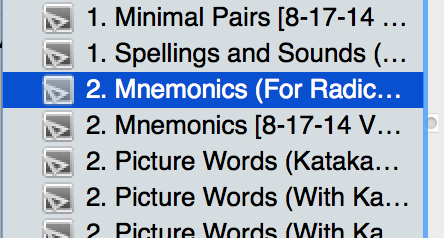 I can learn them all at once in the beginning, but it’d be more entertaining (and easier) to learn a subset of those components first (the very frequently used ones), and then start learning any new radicals I need in the context of actual words. That’s where this deck comes in – it teaches the most frequently used radicals. On Wikipedia, there’s a list of 48 radicals that – when combined in various ways – will produce 75% of the Kanji you need for fluency in Japanese. So if you can really robustly connect those radicals to images, memorize exactly how to write each of them, and remember a character or two that contains them, you’ll have a mental framework that will enable you to remember all the OTHER Kanji that you may encounter. And if that framework relies upon concrete images, rather than translations or abstract terms (for instance, connecting 攵 to a movie director’s chair, rather than a vague concept like “ACTION”), each component radical will ultimately become more memorable and therefore useful for our needs. An image that had something to do with the traditional meaning of that radical (when possible), and if not that, then the shape of that radical, or whatever KanjiDamage was using, since I like their site so much. I ran into problems with steps 1, 3 and 4. For step 1, I wanted to break down the radicals further than Wikipedia did. Wikipedia, for instance, says that 貝 is the ‘shell’ radical. But Kanjidamage breaks that into a combination of eye (目) and animal legs (the two lines on the bottom), and I liked having those little ingredients as separate cards. So each time I tried to make a card for one radical, I often ended up making 2-4 additional entries for each radical’s component parts. I ended up with 80 radicals instead of 48. For step 4, I grabbed Stroke Order Diagrams from Jisho, but since I was using lots of untraditional radicals, like “Animal Legs” and “Kick in the nuts” from Kanjidamage, I had to do a fair bit of work to find the stroke order diagrams for these little components. All in all, it took me longer than I’d want one of my readers to spend on this work, so I thought it’d be handy to spare you all the hassle of looking things up, so you can focus on actually learning this language. 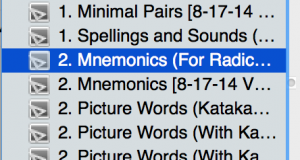 Second, once you choose your mnemonic and have established your OWN mental association between the key word and the image you chose, delete the English word. That word is not going to help you learn Japanese, it’s not in my personal deck, and it screws up the way the cards look when you review them. I seriously spent an hour of my life, adding those words in, just so you could delete them. You owe me back that hour by making the associations in your head and then deleting the word. Third, look at the example characters containing the radical, and look at the images I’m using for those characters. If you want to choose different images, do so. Your images are better than mine, because they’re yours. I have a picture in there of Los Angeles for the concept of “Hometown.” Los Angeles is probably NOT your hometown. So go back to Google images and make the images your own. Fourth, in that same collection of example characters, look at where they contain the radical, and how they relate to the idea of the radical. In this case, urine has Water 水 on the bottom right, surrounded by the Corpse radical, 尸. Urine is corpse water. Best language ever. Make those connections yourself and create a visual story in your mind. If the connections seem random or weird, then so much the better. Streetlights are made of nails and torches. Men are made of rice paddies and flexing biceps. Silver is made of gold, the sun and a kick in the nuts. Once you’ve made your connections and you’ve changed any images you wanted to change, delete the English word here too. 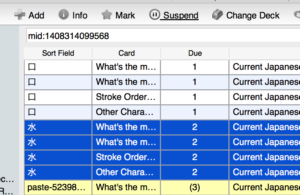 Now those cards are active, and you’ll see them whenever you study new cards. But Gabe, this process sounds like work! Well of course it’s work. 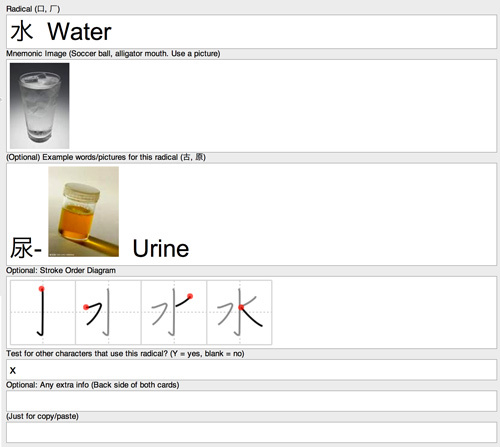 I can spare you the work of collecting the data in one place, but I can’t spare you the work of making the mental associations you need to make to teach yourself Japanese. Besides, that’s the fun work. It’s where you build your own language in your own head. All these flashcards are meant to do is reinforce that work. Anyways, at this stage, it’s time for some download links. Enjoy, and let me know how it goes in the comments! Download the zip here, unzip it, choose your deck, and double-click on it. One deck is just the Radical Deck described here, and the other’s combined with the Model Deck described on the Logograms page. If you don’t know how to use Anki yet, go here FIRST and watch the videos. 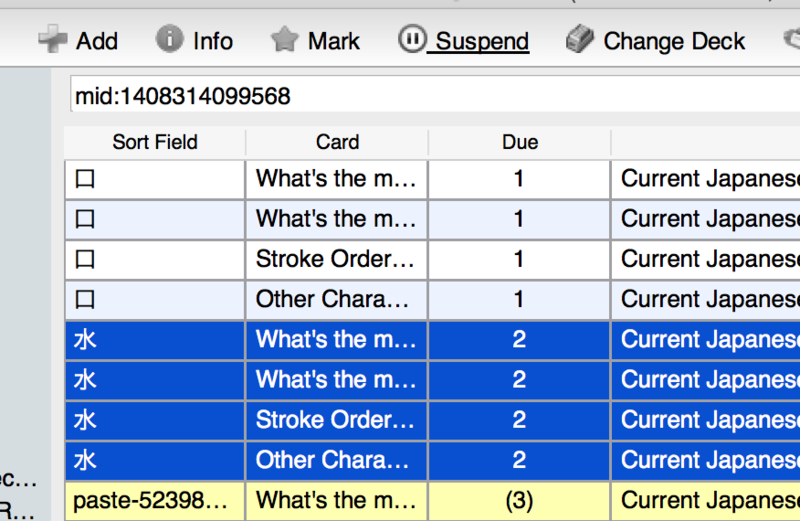 Update, 2-2-16: My Anki card models for Japanese (and the ones I’d use for Chinese) have been evolving over the past year. I’ve been posting new versions in a number of blog updates, but I figured it’d be good to combine everything into one deck. You can download that model deck here. 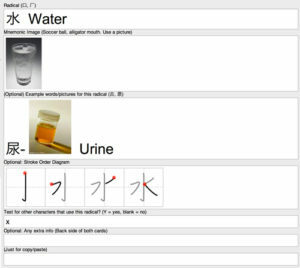 The minimal pairs, spelling cards and basic mnemonic cards are the same as my normal model deck, but I’ve added an extra type of mnemonic card that better supports mnemonics for Kanji/Hanzi characters and an All Purpose Japanese/Chinese card that you can use for Picture Words and sentences alike (explained here).